Thank you very much for visiting my blog in the past. Every single visit and page view from you constitutes my little achievement here. 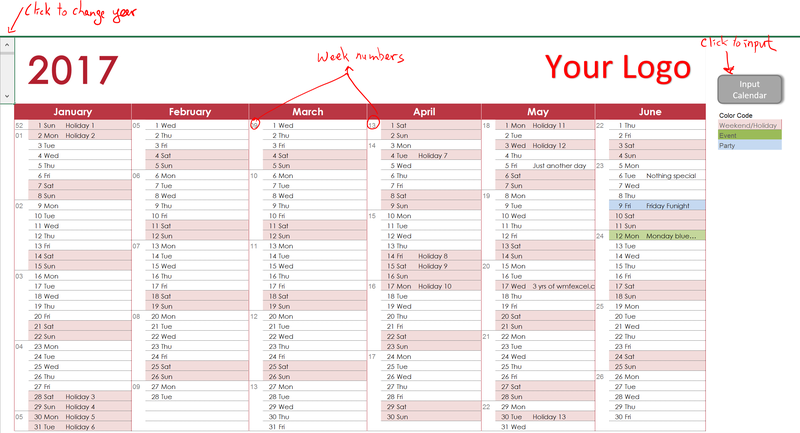 As a token of appreciation, I want to share a template of working calendar with you. Here’s a snapshot of the calendar. It is a combination of natural calendar and retail calendar. You may find it more relevant if you are working in a retail company. I believe this calendar is set up in a way that is easy to use. Although the “Calendar” sheet is protected, there is no password set. If you wish, you may unprotect the sheet and do the “reverse engineering” to understand how it works. You may download the Free Template – working calendar here. I hope you like it. This entry was posted in General, Template. Bookmark the permalink. Thanks for your feedback. Please try to download the file again. Unfortunately, color coding does not work. Conditional formatting refers to “Table2” !? Pls download the file again. That should work.